Home » El Dorado “Durango-Suave” Snakeskin straps: We’re Seeing Red! 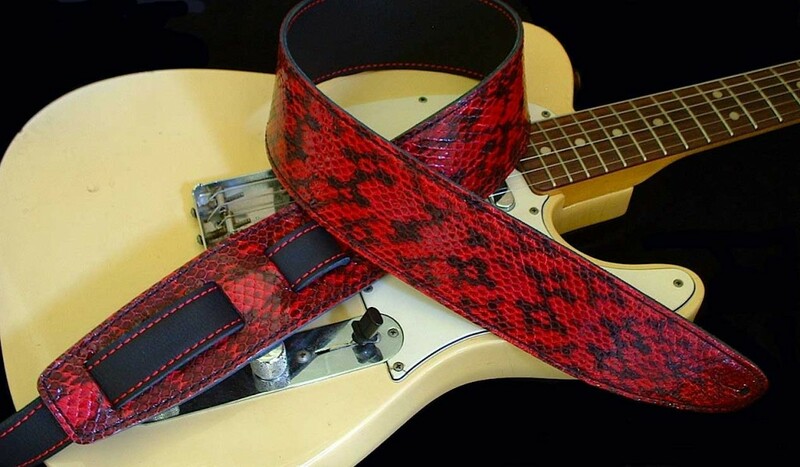 Our beautiful exotic “Durango-Suave” Snakeskin strap model (a huge hit at the recent Dallas International Guitar Show) has a new limited-edition addition: Red! Red is to Rock n’ Roll what peanut butter is to jelly, what Harley is to Davidson, what Les is to Paul (well, you get the idea). Our new red snakeskin strap is constructed with genuine snakeskin and two layers of our buttery-soft “suave” leather. Want to stand out in the crowd, want to make a statement, like red? We have a limited production of this unique color. Currently this strap model is available via phone order only, but based on your response we may make it part of our regular selection. Let’s hear from you! This entry was posted in Product News on May 9, 2013 by Bill Silverman.